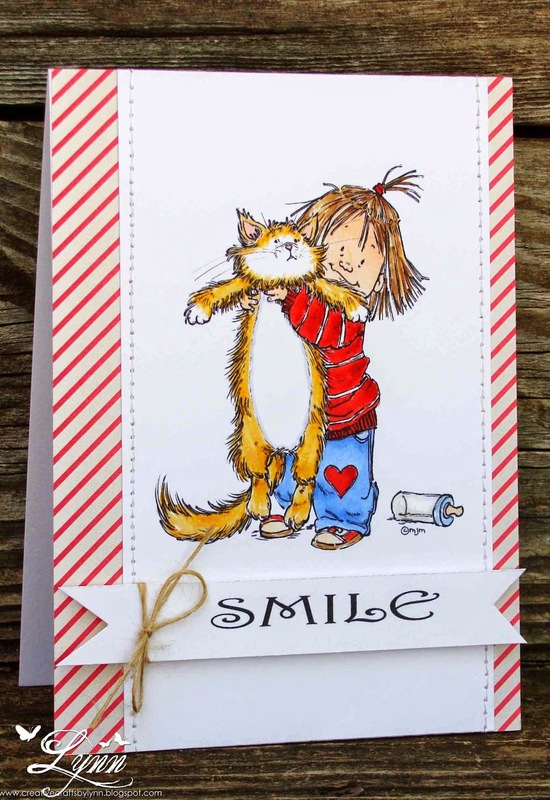 Creative Crafts by Lynn: Smile on a Fun Friday! I can see why you like this image. It brought an immediate smile. Great coloring too. Great card and a sentiment to match. Oh my what a cute image and the kitty doesn't look impressed LOL. Love it! Oh I love that image, it's adorable! Fabulous coloring and stitching!! Gorgeous card Lynn, I like the adorable image and the colours. You know I love that image and your coloring (and stitching) looks amazing! Love all the red. You make me laugh, want to do that to Jim! Wonderful card and fabulous coloring. The stitching looks perfect and very straight! I always smile when I see this image and remember my girls carrying their kitten just like that! Poor kitty! Great job of coloring and I love the paper peeking out around the image! Love this card, Lynn!! Great coloring and card design. So much fun, Lynn. Your coloring is simply fantastic! I think this is one of the few Mo's images I have collected but, of course, it has a feline so... :-D Marvelous stitching. Love this Lynn - that poor cat ;-)!! Your colouring and stitching look pretty good to me. This is so adorable and a totally sweet card! 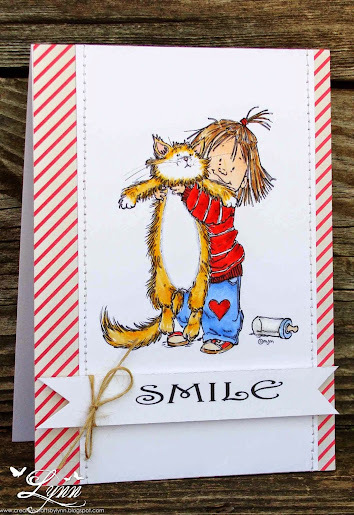 Fabulous image and a lovely card - I'm still smiling here :) Poor kitty. Yes, I will smile, Lynn! This is so precious! I can totally see why you like this image. It puts a few little ideas in my head, also! It sure makes a person smile! If you have not seen the movie that Carol is speaking of, it's a must! Oh how cute, I love the image. Thanks for joining the challenge with Sarah Hurley. This image is just too cute and your stitching...well, wow!!!! I wish I could do that. Your coloring looks fab, too. I had a speedy trip out of state this weekend and just got back this afternoon late...playing catch up. How sweet this is- hahaha Jim better look out, huh? I love your coloring- it is soooo amazing! Hope you get a little rain so you get lots of goodies from your garden! Oooh so cute. The girl seems quite happy, not sure of the poor cat, though. Just stole a moment at work to pop in just because I needed a bit of sunshine as my marathon of work days begins....This card was the perfect solution! It truly made me smile! Now I must get back to college seniors....Come on May 19!!!! I need me some Bubble Time. Mums the word....I should NOT be over her peaking at your lovely cards.... shhhhhh. Hee hee I love this stamped design. It evokes so much happy imagery. Cats can be so tolerant of the whims of little kids. Great job on those straight seams! Woot! Isn't that image adorable...you did an awesome job of coloring, Lynn, and I looove all that straight stitching!!!!! Such a cute card, I love that you havn't used too many colours too. the stitching finishes it perfectly. Thank you for joining us at the Sarah Hurley challenge. LOL! Poor Jim! She reminds me of me when I was little-always dragging a cat around! You did an amazing job coloring this and the stitching looks awesome too! !